The AES-IP-39 (EIP-39) is IP for accelerating the AES symmetric cipher algorithm (FIPS-197), supporting all NIST modes including ECB, CBC, CTR, CFB, OFB, CCM, GCM, CBC-MAC, CMAC, XTS, F8, F9 modes of operation up to 6.4Gbps @1GHz. 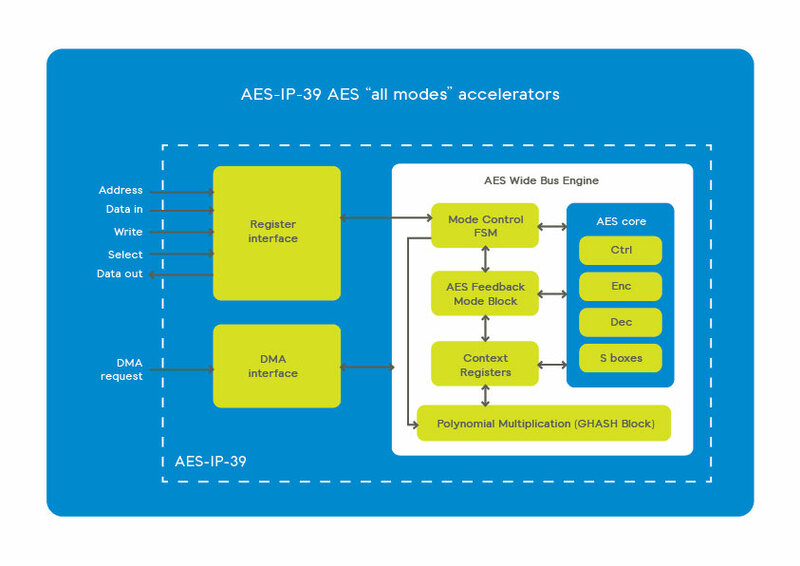 Designed for fast integration, low gate count and full transforms, the AES-IP-39 accelerator provides a reliable and cost-effective embedded IP solution that is easy to integrate into security modules needing versatile crypto. 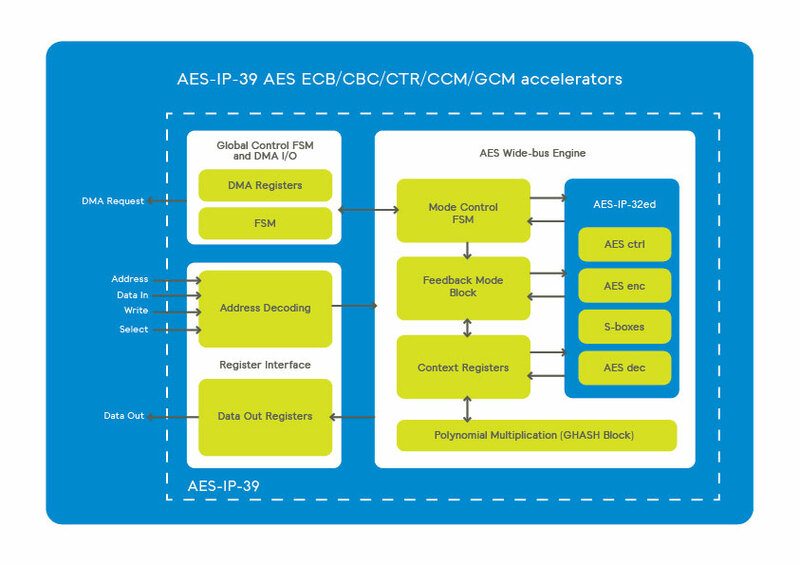 AES family of accelerators, all modes. Optional counter measures against side channel attacks and fault injection attacks. Library element for VaultIP platform security engine. The AES-IP-39 is a family of the cryptographic library elements in Inside Secure’s HW IP library. For example, the lightweight configuration of the AES-IP-39 is the cipher core embedded in all Vault-IP platform security engines as well as the Crypto-IP-120 DMA crypto core. The accelerators include I/O registers, encryption and decryption cores, and the logic for feedback modes and key scheduling. Sustained performance for any object sizes ranges from 1Gbps to 6.4Gbps depending on the configuration and area. Gate count is between 27K and 45k gates depending on the configuration. The AES-IP-39 / EIP-39 can be provided including counter measures against side channel attacks and fault injection attacks. Feedback modes: ECB, CBC, CTR, OFB-128, CFB-128. Protocol modes: CCM, GCM, CMAC and XCBC-MAC. Optional modes: AES-XTS, OFB, f8 and f9. Low Speed, Medium Speed, High Speed versions.